The sun, which sustains all of life, is a powerful force. Limited sun exposure is beneficial to our overall health, assisting the body in producing bone benefiting vitamin D and assisting in healthy brain and hormonal chemistry. We only need about 10 minutes of sunshine per day. 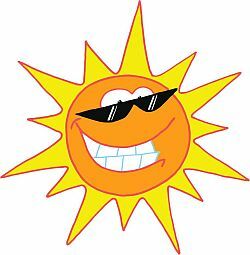 But excessive sun exposure is the number one cause of extrinsic (external) aging and can breakdown the skin’s immunity to the sun leading to skin cancer. While these sunscreens protect against sunburn, there is no scientific research that chemical sunscreen protects the individual against melanoma, basal cell carcinoma or premature aging. Chemical sunscreens encourage individuals to prolong their sun exposure, increasing their risk of skin caner and premature aging. A suntan is actually your body’s way of trying to protect tissue. When excessive sunlight absorbs into our skin free radicals and enzymes are formed. The enzymes break down fat that then produces arachidonic acid. Arachidonic acid is a precursor to the inflammatory response which is linked directly to aging. When free radicals are formed, a chain reaction begins, triggering “transcription factors” that lead to damage to the collagen cells. This damage is called “microscarring” and is the actually forming of a wrinkle. Damaged collagen looses its flexibility and resilience. The idea that sunscreen prevents cancer is a myth promoted by a profit-seeking tag-team effort between the cancer industry and the sunscreen industry. The rate of skin cancer has increased four-fold since the introduction of chemical sunscreens on the market. According to the Skin Cancer Foundation, more than 600,000 new cases of skin cancer are diagnosed annually. And, even with all the information we have today about the harmful effects of ultraviolet radiation, this number is rising. Skin cancer causes 8500 deaths annually in the United States alone and is the most common type of cancer in the country. Allergy-creating PABA, benzophenone-3, homosalate, octyl-methoxycinnamate (OMC) 4-methyl-benzylidene camphor(4-MBC). While these chemicals protect skin from sun damage, experts have indicated the chemical octyl methoxycinnamate, which is present in 90% of sunscreen brands, was found to kill mouse cells even at low doses. Almost all Sunscreens contain Dosesbenzophenone-3 (Bp-3), homosalate (HMS), 4-MBC, octyl-methoxycinnamate (OMC), and octyl-dimethyl PABA (OD-PABA) Other harmful and common chemicals include cinnamates (cinoxate, ethylhexyl p-methoxycinnamatae, octocrylene, octyl methoxycinnamate), silicylates (ethylhexyl salicylate, homoslate, octyl salicylate), digalloyl trioleate, and menthyl anthranilate. All of these chemicals are banned in Europe. Scientific evidence shows quite clearly that sunscreen promotes cancer by blocking the body's absorption of ultraviolet radiation, which produces vitamin D in the skin. Vitamin D, as recent studies have shown, prevents up to 77 of ALL cancers in women(breast cancer, colon cancer, cervical cancer, lung cancer, brain tumors, multiple myeloma... you name it). The toxic chemical ingredients used in most sunscreen products are actually carcinogenic and have never been safety tested or safety approved by the FDA. Chemicals get absorbed through the skin, your largest and porous organ and enter the bloodstream. Eating berries and microalgae (spirulina, astaxanthin, blue-green algae, etc. ), help you build up an internal sunscreen that will protect your skin from sunburn from the inside out. Sunburn is actually caused by nutritional deficiencies that leave the skin vulnerable to DNA mutations from radiation, but if you boost your nutrition and protect your nervous system with plant-based nutrients, you'll be naturally resistant to sunburn. If sunscreen is so bad for humans, you might ask, then why do so many doctors recommend using it? This might be hard for you to believe, but it wasn't too long ago that doctors routinely recommended smoking cigarettes, too. The Journal of the American Medical Association, in fact, ran numerous ads promoting Camels as "recommended by more doctors than any other cigarette!" Doctors talked up the "benefits" of smoking cigarettes, urging people to start smoking in order to improve brain function or even -- get this -- make their teeth stronger! Also keep in mind that doctor-prescribed medications are the fourth leading cause of death in America today. About 100,000 Americans die each year from following the advice of their doctor. Does it really make any sense to get your health advice from a group of professionals who kill more Americans each year than all the terrorists have ever killed in the history of this country? Besides, doctors know that if they start recommending sunlight and vitamin D, they'll lose patients and profits because people will start getting well and have no need to keep visiting the doctor. Vitamin D, as you will learn in our free report, The Healing Power of Sunlight and Vitamin D, (http://www.newstarget.com/rr-sunlight.html)prevents not only cancer, but also diabetes, osteoporosis, depression, heart disease and obesity. It's the miracle nutrient of the millennium, and yet the entire medical profession tries desperately to pretend that vitamin D has no biological function whatsoever. Hence the support of sunscreen (the anti-vitamin D product). The marketing of sunscreen is another great example of consumer product companies fabricating a need in order to sell a high-profit product made mostly with toxic chemicals. There is no need for sunscreen, but the cancer industry and sunscreen manufacturers have created a fictitious need through a campaign of fear and disinformation, hypnotizing practically the entire population into believing one of the most ridiculous ideas in the universe: that sunlight is bad for human health. Think about it. Our ancestors did not have indoor lighting; they exposed their skin to the sun regularly. They didn't run and hide from the sun, they used it as nourishment to generate a crucial vitamin that supports human health in a multitude of ways. The idea that "the sun is bad for you" makes about as much sense as "water is bad for you" or "the Earth is flat." This persistent myth was invented, marketed and publicized by an industry that profits from a gullible public believing demonstrable falsehoods. But why would the cancer industry go along with the deception, you might ask? Because the continued commercial success of the cancer industry depends on more people getting cancer. In previous articles, I've clearly shown that the cancer industry has no interest whatsoever in preventing cancer. The industry, in fact, takes steps to interfere with prevention efforts and thereby ensure the growth in the number of future cancer patients. The American Cancer Society, for example, still will not recommend that anyone take vitamin D supplements, even though the vitamin can prevent nearly 4 out of 5 cancers. The cancer industry simply has no interest in preventing cancer. It is only interested in treating cancer and profiting from those treatments. (That's why genuine cancer cures have been routinely suppressed, censored or discredited in the United States.) Read my book, Natural Health Solutions and the Conspiracy to Keep You From Knowing About Them, to learn the shocking truth about how the cancer industry really operates in America today. The promotion of sunscreen products is a way for the cancer industry to ensure future profits from the treatment of cancer. The more people use sunscreen products, the more they'll get cancer. And that's due to two primary reasons: 1) Sunscreen blocks vitamin D production, a nutrient that strongly prevents cancer, and 2) Sunscreen products almost always contain cancer-causing chemicals that are absorbed through the skin and enter the bloodstream where they cause severe DNA damage, leading to cancer. 7) If sunlight is so dangerous, then why is virtually every living creature on planet Earth dependent on sunlight for survival? Plants use sunlight to generate their nutrition, too, and most animals eat either plants or other animals that originally ate plants. Nearly all life on planet Earth is powered by sunlight. Why does the cancer industry believe sunlight causes death when, in reality, sunlight delivers life? Once you answer these questions, the reality of the situation becomes obvious: Sunlight is good for you, and sunscreen is a hoax. The Healing Power of Sunlight and Vitamin D This provides tips on how to safely gauge your level of exposure to sunlight. Don't just rush out and get burned; boost your nutrition and work up a natural tan as nature intended. The best sunscreen, however, is an internal sunscreen built with nutrition. Eat chlorella, spirulina, goji berries, raspberries, blackberries, blueberries, astaxanthin, carrots and nutrient-rich superfoods to boost your skin's natural UV protection (takes about 30 days of nutrition to boost skin levels).